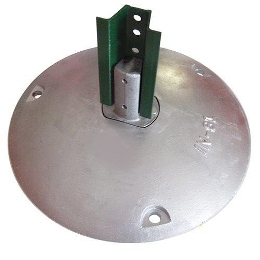 The Aluminum Sign Post Mounting Base can be used for temporary signs as it's 15" diameter base provides excellent stability. Permanent applications into concrete or asphalt can be made using the base's 3 mounting holes. Base stub is replaceable if the post and sign are struck. A new post and and/or sign can easily be replaced by mounting it back to the base. Aluminum Sign Post Mounting Base is compatible with all our 2lb per foot U Channel & Square Sign Posts. Our 2-3/8" Pipe Posts will work but holes have to be drilled in the post to mount it. 1.12lb per foot U Channel posts will not fit the base stub and will not work. *Hardware to mount post to stub and stub to base included. Stub is included with base. For permanent mounting applications into concrete, galvanized lag shields, washers and screws in 3/8" are recommended. 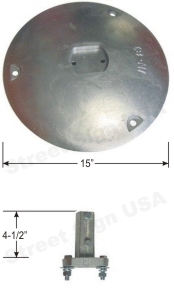 For asphalt, 12" galvanized spikes are recommended and can be found in most hardware stores. Replacement stubs are available, Item# SP-IN81S which are sold separately.